More shortstops pay homage to Ozzie Smith than Ozzy Osbourne, but Eli Christensen is not your typical college baseball player. Not many are 25 years old, married, and have completed a two-year religious mission. If there are any others, it's doubtful they walk to the plate accompanied by the famous chords of Black Sabbath's "Iron Man." 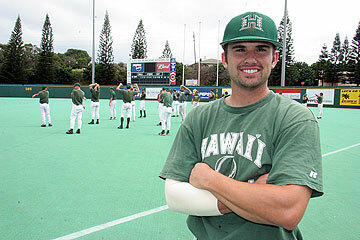 Promotion: "Students in Green Weekend" -- any UH system students wearing green shirts get in free. Students must present a validated Spring 2007 ID to get the free ticket. The first 200 students to enter the stadium on Saturday get a coupon for a free medium soft drink. "I've always liked that song," Christensen said. "I'm an Ozzy fan in general." While the title character of the classic rock hit climbs from weakness to omnipotence through the course of the song, so does Christensen's effectiveness as a hitter as the season moves along. For the second year in a row, he started slowly only to heat up as conference play approaches. He's now batting .300 as the Rainbows (15-8) start a four-game series with Wisconsin-Milwaukee (0-9) at Les Murakami Stadium tonight. Coach Mike Trapasso said he never doubted Christensen would begin to hit like he did in 2006, when he batted .301. "He'd been a .300 hitter at this level. He was just not getting on top of the baseball and hitting too many fly balls," Trapasso said. Toss a baseball from the dugout bench so it comes to rest on a step a couple of feet away. First step, single. Second step, double. And so on. If the ball falls off the steps, it's an out. 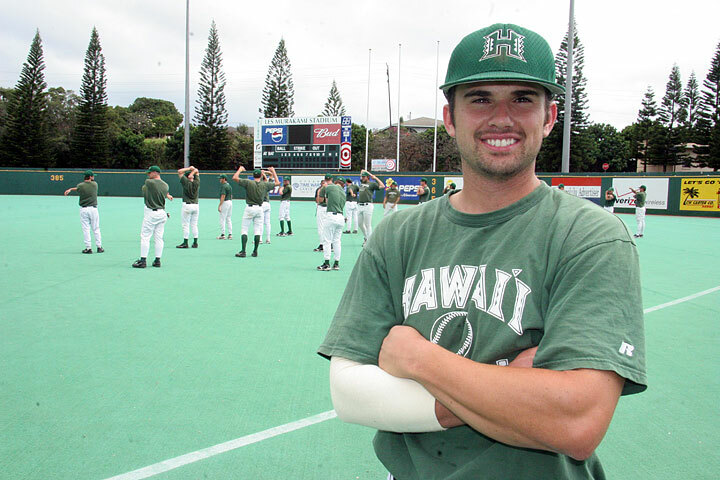 One day before Hawaii baseball practice, infielders Eli Christensen and Vinnie Catricala go to the 10th inning before Christensen applies the perfect spin twice for back-to-back doubles. He wins, 1-0. "What do you call that game?" "I don't know," Christensen answers. Then he cracks a smile. "But I know I'm the champion of it." 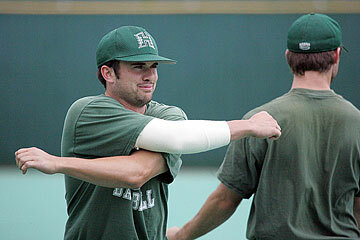 At the time, the Rainbows' senior shortstop was just 3-for-19 at the plate after UH's first two series. Younger players off to such a start would be too tight to enjoy such clubhouse fun and games. But Christensen has things in perspective. He likes what some people call devil music (Black Sabbath's "Iron Man" is played when he comes to the plate), but he spent two years on a religious mission. He grew up in Provo, Utah, in the shadow of Brigham Young University, when the Cougars were the Rainbows' biggest rivals. He is a 25-year-old married man (Lindsay), and his teammates call him "Pops." So Christensen is mature enough to know going 0-for-4 isn't the end of the world. Since his slow start, he has batted .352, and his season average is up to .300. He went 6-for-9 against Arizona last week, and is UH's hottest hitter headed into this weekend's series against Wisconsin-Milwaukee (0-9) that starts tonight. UH enters 15-8. Christensen is actually ahead of schedule, compared to last year. In his first season as a Rainbow, the transfer from Salt Lake City College didn't heat up until April on his way to a .301 mark and .392 in conference play. "Everyone's telling me I was patient," UH coach Mike Trapasso said. "But I never saw anything that made me think otherwise that Eli would start to hit. He had the same start last year and came around. He's a senior who's been through it. He's a leader and mature. I'm glad he's starting to swing." Christensen said he didn't have to make a physical adjustment at the plate. "I don't think I was getting bad swings; my mind-set was a little different than it is now. Balls will fall in more if you have the right mind-set. You can have a great swing, but if you're not confident, it seems like bad things will always happen." He's also trying to take that approach into the field. Christensen has made eight errors in UH's first 23 games, and it looked like he might be suffering lingering effects of an elbow injury from last spring. But his throwing motion looked a lot better last Sunday. "I was a little hesitant because of the injury and I hadn't thrown much in the fall and all through summer," he said. "I think I just lost some of my confidence, almost like trying not to make a mistake. The coaches told me to just let it go and not worry about anything." Plus, Christensen knows there are people with worse problems than throwing a ball away every now and then. After junior college, he lived for two years in Connecticut on a mission for the Church of Jesus Christ of Latter-day Saints. He spent some of his time recruiting new church members (at which he was successful), but also found performing good works rewarding. "It was a good experience. When you talk about maturity, I think that helped me gain some. Being away from home two years, serving other people," Christensen said. "We volunteered at soup kitchens and helped build homes for needy people." The experience also helped Trapasso decide Christensen would fit in on his ballclub. "When I first saw him I liked him," Trapasso said. "But I was kind of noncommittal on him until I found out he had been on a mission, he's older, married, a mature kid. I thought he could bring that stable influence to our team, and he has."